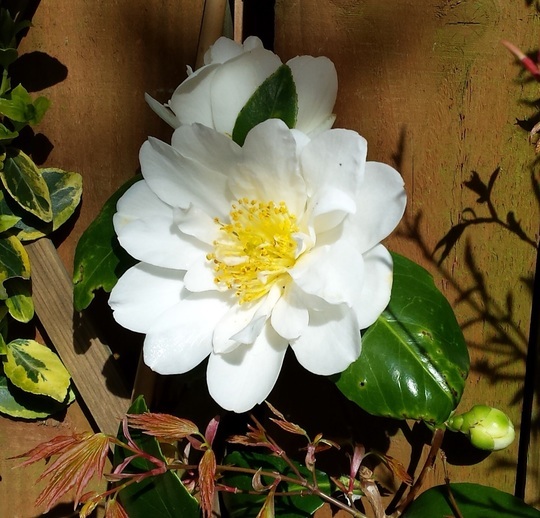 Pretty white camellia planted in a semi shaded corner of my little back garden. Gets a little sunshine late in the afternoon/early evening. Bought it from a local supermarket a few years ago. Thank you Bathgate and Thrupennybit, pity I’m not sure of the variety! Thanks Karen, just hope with every year I may get more flower! Thanks Thrupennybit, I will have a look at some other pics of Sasanqua. Thank you for the info, much appreciated! I see your Acer is breaking bud already Kate! Hi Karen, apologies. I should’ve dated the pic. It was April last year. There's a lovely white Camellia along our road, but the flowers look yuck after a frost. Hope those pretty blooms of yours are well sheltered. Hi Siris, I know what you mean, they can look pretty rotten in bad weather. This one is right in a corner, quite sheltered by a large laurel and other shrubbery. It get a little bit of sun exposure, although only for a short spell in the day! That's good that it's tucked up somewhere reasonably sheltered.